In “Family Descent as a Signal of Managerial Quality: Evidence from Mutual Funds,” Oleg Chuprinin and Denis Sosyura find that mutual fund managers from poor families consistently achieve better investment results than fund managers from wealthier backgrounds. The researchers also find significant differences in promotion patterns and trading styles between these two types of fund managers. Previous studies about the relationship between managers’ upbringing and their performance have focused on educational differences, including whether the managers attended elite universities or had access to education-related networks of influential people who could later help boost their careers. Such studies tend to find that managers with a stronger educational background tend to deliver better performance. This study relies on hand-collected data from individual U.S. census records on the wealth and income of managers’ parents. The researchers also identified and verified fund managers via Morningstar, Nelson’s Directory of Investment Managers and LexisNexis Public Records. They ultimately identified hundreds of fund managers, most born in the mid-1940s, whose parents’ census records were in the public domain. They then examined the performance of hundreds of actively managed mutual funds focused on U.S. equities between the years 1975 and 2012. The researchers find that mutual fund managers from wealthier backgrounds delivered “significantly weaker performance than managers descending from less wealthy families.” Managers from families in the top quintile of wealth underperformed managers in the bottom quintile by over 1 percent per year on a risk-adjusted basis. The researchers emphasize that these findings do not imply that those from poor families are in general better at their jobs than those with a more fortunate background. Rather, because individuals from less-privileged backgrounds have higher barriers to entry into prestigious positions, they argue, only the most skilled advance and succeed. Indeed, in tracking career trajectories of mutual fund managers, they find that the promotions of managers from well-to-do families are less sensitive to their performance. In other words, managers who are born rich are more likely to be promoted for reasons unrelated to performance. In contrast, those born into poor families are fewer in number and are promoted only if they outperform. 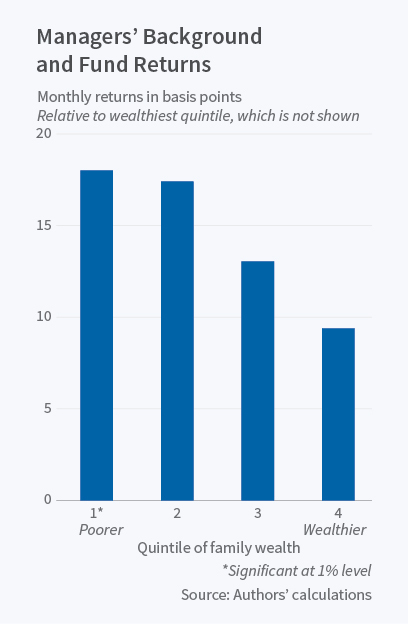 They also find that fund managers from less-affluent families who do make it into top ranks are more active on their job: they are more likely to trade and deviate from the market, whereas those born rich are more likely to follow benchmark indexes. 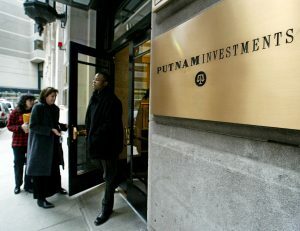 The researchers note that they chose to study mutual fund managers, because they often work independently and because funds’ performances can easily be measured for comparison purposes. But they say their findings about family background and job performance may have implications that extend beyond asset management. “Our evidence suggests that an individual’s social status at birth may serve as an important signal of quality in other industries with high barriers to entry, such as corporate management or professional services,” they conclude.